I'm not really a huge fan of the big v-day or even the hearts month. But today, I think I just changed my mind. I may not admit it (and I think most of you too) but I feel special or "kilig" whenever I receive beautifully arranged flowers or just flowers in general.That's what I felt today, heeeeeee. :) I'm totally inlove with this bouquet! This gorgeous bouquet is from my friend's flower shop--Tecson Flowers. Honestly, this is the best arrangement I've seen so far (and I don't even like roses). It's the first time I ever appreciated roses in general (I'm a malaysian mums girl) and drooled over them. When I saw them I literally had that "I'm so fluffy I wanna die" moment. It's that nice. The materials used are also unique and nicely put together. 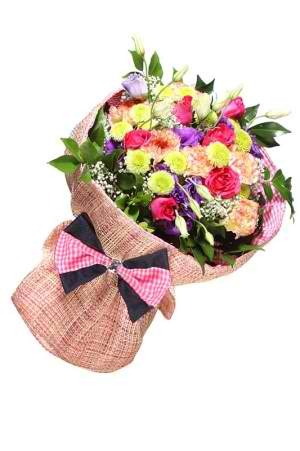 Parang I want to shift na sa flower styling! For serious. Hehe. The one I'm holding is from their Me So Pretty designer series. It comes in 5 trendy pastel spring colors--orange, pink. green, blue, yellow. It's a combination of Denim, Burlap & Checkered--so country, pretty, stylish & tasteful! You can even choose the flowers. :) My favorite is this pink one! gorgeous roses, satin flower bed, cute bow--*swoons*. If you can't visit their branches, you can just order online and have it delivered (i hope not to yourselves, or pwede din hehe). And the bow...the boooooow!!!! I want to take it off and include it in one of my outfit posts. Haha. Too cute. Some say red roses are overrated, unlucky me have never received any! ... Wishing for them, pleaaase get me a Valentine! They're so pretty! love the flowers but your skirt first caught my attention. Allan, please read this daw! chos! I wouldn't mind having chocolates on the side and please don't give me flowers in public! haha! Haha, sige! Will check them out. I was thinking of buying flowers din eh. 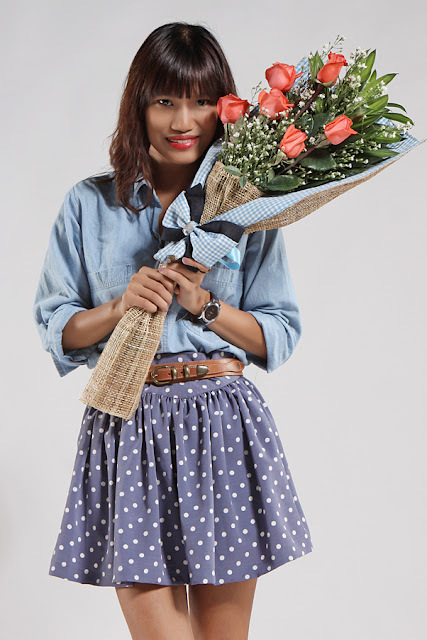 love your outfit and yeah, doesn't hurt to receive flowers on V-day and not just when you're hospitalized or what-not.